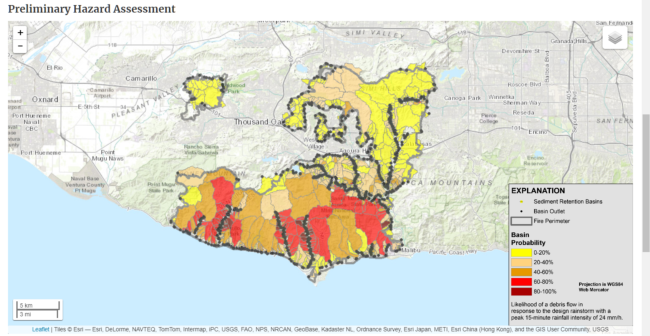 In Southern California, and in many parts of the state, wildland fires are followed by rain - in fact, while fires may be "contained" by suppression activities, they usually aren't OUT until a rain event. That means burned landscapes and watersheds are at risk of debris flows (commonly called mudslides) right after a fire. General principles for erosion control are to make sure, as much as possible, than culverts, storm drains, and debris basins are clear, and to use sandbags, straw bales, or straw wattles to guide water and debris away from remaining structures. In many areas, the best practice is to minimize disturbance to burned slopes, but you will need an inventory of slope, burn severity, and soil structure to develop site specific plans that may include applications of straw mulch, hydromulch, or erosion control fabrics. Seeding is VERY RARELY a useful approach, and can cause damage to remaining seed beds and vegetation. In the Woolsey and Hill Fire areas, visit http://venturacountyrecovers.org/ to find hazard assessments, a homeowner's guide to erosion control, and other resources. When in doubt, we suggest being guided by the principle that stuff is replaceable, lives are not. Preliminary Woolsey and Hill Fire Hazard Assessment from USBR, 11/20/18. Click on the image for an updated assessment. Fires are a natural occurrence in most of California, but recent fires have broken records for size, duration, and tragically, loss of life and property. 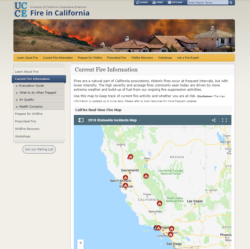 UC Agriculture and Natural Resources Experts have come together to share information about what you can do to prepare for and recover from fire, as well as steps to take during a fire. This includes information on landscaping, home construction, air quality, erosion control, and recovery for various crops. It's not specific for any single event, and is under constant review and improvement. It's also meant to be applicable to a variety of climatic and ecological conditions around the state. Fire resistant landscaping can help protect a home from many fire conditions, but it is also the best practice for re-establishing a landscape after a fire. For a guide to fire-resistant landscaping for Southern California, visit our SAFE Landscapes site.